Lambeth UNISON recently co-hosted a meeting in Brixton on the topic of defending and extending Freedom of Movement. 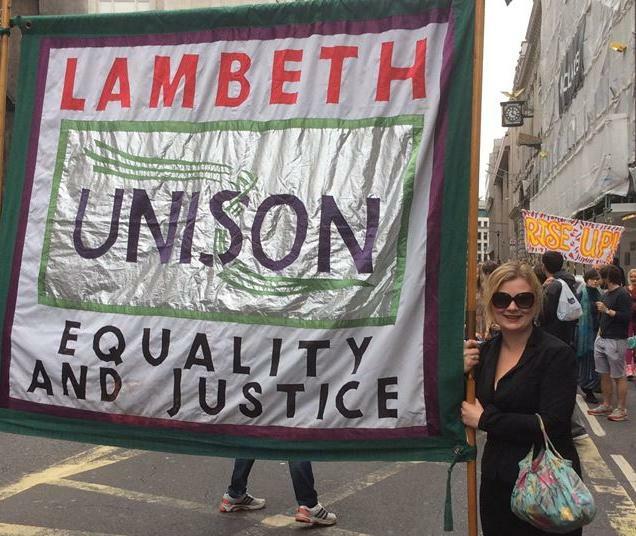 Lambeth UNISON was represented by our Branch Secretary Ruth Cashman. This is the text of her speech. I think it is good idea to begin today by starting very big picture wise from where I’m coming from, in the big picture sense. I think it is very easy to get into arguments about wage levels, demand curves and EU directives whilst not actually resolving if you have a common starting point and aim. 3. We, the Labour movement, are a mass force, just in Britain 7 million people in unions, 600,000 in Labour and linked to other labour organisations across the world. We can fight on political and industrial grounds. We need develop and campaign for demands to change society in the here and now, which build the movement that can fight for genuine internationalism and to overthrow capitalism – a barbaric, murderous system. Here, immigration is reduced to an inhuman flood which needs “controlling”, as if migrants and refugees are a raw material scooped up by “neo-liberalism” and “dumped” in Britain. Migrants and refugees are human beings, making choices, sometimes but not always in awful circumstances, to migrate in order to seek a better life for themselves and their families. They need our solidarity, not our hostility. You can dress it up as “the supply of labour” or as “strains on our schools and hospitals” all you like, but what you’re talking about is, people. The supply of labour – are workers like us, strains on schools and hospitals are children and the sick – like our families. There is no realistic way to “control the flow of people” without coercion: without guns, fences, detention centres, border guards and police. This is the the basic socialist opposition to immigration controls. Any border control necessarily implies violence and coercion. Violence and coercion as a mechanism for discriminating against some workers, on the basis of their national origin. It can’t be anything but racist. Fortress Europe, quotas, point systems, you will not find a clever trick to create the non-violent, anti-racists border control. That doesn’t mean all advocates of immigration controls are themselves racists. The vast majority of advocates in our movement are proud, active anti-racists. But a policy which has at its core discrimination between workers on the basis of where they come from has an unavoidably racist impact, no matter how much its supporters protest that they want the discrimination to be organised “fairly”. That means no rolling back of freedom of movement but it also means extending that right and offering political support and practical solidarity to migrants and refugees whatever their status. Our unions should organise these people our party should advocate for them! In Labour we hear an even creepier argument – though we know these things aren’t true people feel like these things are true, and if political parties wish to win their votes, they must be seen to address these feelings and respond to their concerns. – the conversation is about how Labour’s policies could address the core issues: by implementing living wages; reversing cuts to public services; building social housing. Tory (and, indeed, New Labour) policies are the causes of their grievances, not immigration and immigrants. With voters hostile to immigration because an influx of migrants threatens their white, English identity, the conversation has to be different. Nationalism and racism exist within our class, and must be confronted. Not by moralistic denunciations or assumptions people won’t change but neither with pandering. We must build up antiracist campaigns and campaigners within workplaces and communities and go out and have the argument. Let’s have no more talk in Labour meetings about “ white working class concerns”. Why are “working class concerns” we must listen to always the anti-immigration concerns of white British born communities and never the “concerns” of migrant workers or refugees worried about threats to their civil and human rights. The workers I am a representative for seem to drift away in this white-washing. Of course the concerns of working-class communities in Skegness and Sunderland are important to Labour, but so are the concerns of working-class communities in multicultural, “metropolitan” cities like London, including migrant communities. I represent a union branch where the majority of workers are not white and the shrinking public sector is not viewed through the veil of racism. I live in a working class community which is majority first and second generation immigrants. I am from a migrant family. This movement is ours as much as it is anyone’s. Some of the most inspiring union struggles in Britain this year have involved migrant workers – The BECTU members in the Picturehouse dispute, Cleaners in UNISON and IWGB. Let us fight for policies which refuse to pit British worker against migrant worker, or migrant against migrant. • Solidarity with refugees and migrants: we are part of a global class, and migrant workers and refugees coming to Britain are our brothers and sisters, not our enemies. • Defend free movement: the existing rights that EU citizens have to migrate to the UK, and vice versa, should be retained. • Restore and increase the Migration Impact Fund: communities that have accommodated large numbers of migrants should receive increased subsidies to expand housing and services. • A £10/hour minimum wage, properly enforced. • Abolish all anti-union laws: restore and extend trade union rights. • Reverse cuts to public services. • End detention: close Yarl’s Wood and other detention centres, end private sector involvement in the immigration system. Every attack on the freedoms and rights of migrants are an attack on the labour movement here and internationally – your freedoms, are our freedoms. Your defeats are ours and so are your victories.